Greetings, patient readers! I’ve had precious little tea news to report for a long stretch; unfortunately, managing day-to-day store operations takes precedence over fun blogging projects, and we’ve been quite busy in the store preparing for the holidays and attending to our loyal customers. This news, though, is too tasty to keep under wraps: With the help of Seven Cups we’ve recently acquired a selection of five top-quality Chinese Wuyi oolongs, which we are now featuring in a special seasonal menu in the store–and just in time for this spate of extremely cold days! 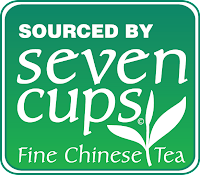 High-quality and authentic Wuyi oolongs can be difficult to come by, which is why Seven Cups’ sourcing skills (they literally personally source all of the teas they carry, traveling to each province of origin and purchasing teas from the tea masters who produce them) are much appreciated–these are great teas. If you’re not familiar with Wuyi oolongs, here’s a brief introduction from way-back. Generally, these are stripe-rolled, roasted Chinese oolongs. Most are named after the cultivar, or genetic “type” of tea plant that they come from. My goals with bringing our customers these teas are first to replace our out-of-stock Wuyi offerings, and second to offer a broad range of teas that exhibit the potential quality Wuyi oolongs can aspire to, as well as the differences between different tea cultivars and processing, with special emphasis on roast level. So, without further ado, here are some brief impressions on our new teas. 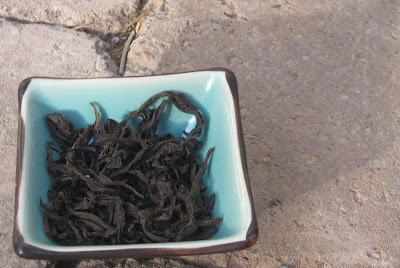 The most widely-acclaimed Wuyi oolong is also the most often-faked. Because of its international popularity, authentic Da Hong Pao is almost always one of the most expensive Wuyi teas, but its popularity is earned. This Da Hong Pao blends the tea’s unique acidity with a really smooth body, making it a little less bright but more balanced than some other examples. The roasting is on the lighter side of medium, with plenty of room for the tea’s floral and buttery aspects to shine, and the rich mouthfeel marches along nicely through the infusions. Da Hong Pao is the standard by which all other Wuyi oolongs are measured, so trying a good one like this is “required tasting,” both so you can understand the ideal characteristics of these teas, but also so you can understand what makes the other cultivars different. Most importantly, though, if your only Wuyi experience has been low-grade, over-roasted generic Wuyi oolong with the words “Da Hong Pao” slapped on the box for the purposes of extra profit, get ready to have your eyes opened! Shui Xian is the most widely-cultivated Wuyi oolong (not sure why, but I assume it’s because of the plant’s hardiness and yield); it’s even popular enough that it’s also cultivated in Taiwan and Feng Huang in Guangdong province. This particular Shui Xian is grown toward the center of the Wuyi reserve and it comes from plants that are over 30 years old. This means the roots have had plenty of time to penetrate the rich soil and receive a well-rounded nutrient supply. This tea offers one of the higher roast levels of the five, but I’d still say it occupies the “medium” range of the spectrum. Shui Xian offers a really balanced flavor with equal measures of flowers, fruits and a wee bit of spice. On first tasting, this is near the top of my list for favorites, and it’s one of the better values of the five. I really enjoyed the thick mouthfeel, and there were some interesting changes from infusion to infusion. Rou Gui is another very popular cultivar, and one of the most distinct-tasting ones at that. Like the name implies, this tea tends to be spicy. I was really impressed by this tea’s medium roasting; many Rou Gui I’ve tried tend to be heavily roasted. To my tastes, a medium roast compliments the dark spice notes more elegantly, although I do have to say I’d prefer heavy roasting to a light roast. This tea has a good, strong tea base, and is honestly probably my favorite Rou Gui I’ve ever tried. Shui Jin Gui is one of my favorite Wuyi cultivars; in my experience it tends to be medium-light roasted, silky smooth, with a pure flavor that makes me want to keep drinking and drinking. In the past week, this tea has already become a favorite with some of our regulars–it’s complex, mellow, and the lightly toasty aroma is remarkably chocolatey. In the cup, it’s one of the lighter of the teas, but I think a lighter roasting is appropriate for a tea with such a nice, darkly floral character. Finally, we have this light-roast Tie Luo Han. Although the roasting level is denoted as “light,” after tasting this tea a few times I’d place it more on the medium level, although it’s certainly not as heavy a roast as this tea traditionally receives. I’ve been really surprised by this tea’s flavor, which strongly reminds me of the sort of spiced apple desserts that are a hallmark of fall and winter American cuisine. The lighter roasting really showcases this fruitiness, whereas a high roasting would probably obscure this element and completely alter the character of the tea. This tea might win the award for most complex of the selection as well. I hope you’ll take the opportunity to stop in and try a few of these teas–In China, winter is traditionally viewed as the best time to drink these warming, roasty teas, and I find myself agreeing more and more with every sip!